Before we dive into role players and how to best use them we should discuss intangibles and why role players are your depth forwards. I’ve said it far too often, to the point of probably annoying many people, but the term “intangible” is a bit of a misnomer. The things people mention when they discuss hockey intangibles are actually latent variables. They are things we cannot directly measure but are assumed to have an effect on a team’s probability of winning. Leadership, locker room cohesiveness, grit, hitting, heart, work ethic, etc. — all of these things matter because they should help the team outscore their opponents. Leadership and locker room cohesiveness are about workplace morale and teamwork, which should improve results. Grit and hitting is to wear down the opponent, gain advantageous positioning, and gain possession of the puck. Heart and work ethic are about optimizing the potential of one’s skill level and keeping a consistent level of play even when the odds become heavy. In the end, we cannot directly measure their impact, but they matter because we assume they have an effect on shots and goals. This means that these values should matter. However, they should not matter more than the on-ice product. There is a greater unknown factor, and therefore risk, with latent variables. Without the ability to measure their impact, it becomes difficult in testing how much they matter and whether you are evaluating players with them appropriately. Bottom-of-the-roster players cover fewer 5v5 minutes, so their on-ice impact is severely diminished. 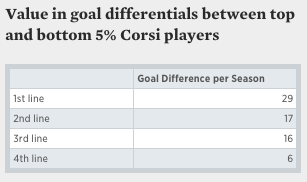 However, a lot of these latent variables should not be as drastically affected by ice time. Let’s say on-ice value is variable X, while intangibles are variable Y. The logic behind whether a player is worth carrying over another depends on who is better after combining both X and Y. Because of this, theoretically a player can possibly be a weaker on-ice player but still be considered better overall. But, there is the issue with no one truly knowing the value of Y, or intangibles. The safest way to look at intangibles then is as a tie breaker. On-ice contributions should still stay the primary focus with evaluating a player. Now there is an alternative way lower end of the roster players can provide additional value besides intangibles. There are many players who can provide legitimate value in non-even strength situations as power play or penalty kill specialists. On average, the best penalty killers and power players are the more skilled 5v5 players, but there are a few exceptions. The additional value provided by specialists are measurable, scalable, and comparable. A special teams specialist provides an additional impact for a role player that a team could be far more confident with the relative effectiveness. Now, before I leave, there is one other subject I want to touch upon. Replacing a player who filled one particular “role” does not mean you need the replacement to fill the same role. The game is about winning. Winning a game gives you two points; there are no bonus points for style. Too often teams and fans become overly concerned in particular types of role players. A role player who provides 3 wins in value helps a team more than one who provides 2 wins in value, regardless how those players provide those wins. Again, grit, hitting, character, and all other types of intangibles are good things to strive for in players, but only because you want to win more games. People think of role players in terms of what type of role the player provides. The goal shouldn’t be in replacing or accumulating certain style of players though; the goal should be to provide wins, as many wins as possible. At the end of the season and the playoffs, it’s not about how you looked winning, but how many wins you get.